Tomorrow is primary day in Delaware -- a special election for the symbolic Biden seat -- and it’s looking like anything can happen. Tea Party candidate Christine O’Donnell is gaining on Mike Castle; according to a new PPP poll, she's actually pulled 3 points ahead of the congressman and former governor. Her commercial comes from the Tea Party playbook: lash your opponent to the White House, turn him into an Obama clone who supports bailouts, healthcare reform, the entire agenda. 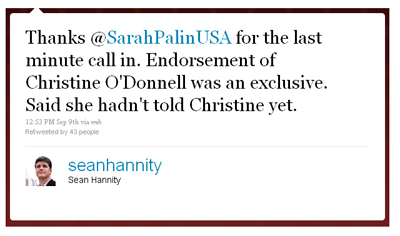 The video showed up on the website of Liberty.com, a consulting firm that was, until recently, employed by the O’Donnell campaign. "I think that that’s a very tacky approach. I never said that Mike Castle was gay. I don’t endorse putting out rumors that Mike Castle is gay." By the way, repetition does stick -- it’s called the illusory truth effect. The more you repeat something, the more likely it is to be perceived as true, if there is a framework for acceptance. And guess what? There is no shortage of politicians, especially older Republicans, who’ve been outed. Further drama. The Delaware Republican Party went to the Federal Election Commission to complain about alleged illegal coordination between the Tea Party Express and the O’Donnell campaign. "You know, these are the kind of cheap, underhanded, un-manly tactics that we’ve come to expect from Obama’s favorite Republican, Mike Castle," said O’Donnell. "You know, I released a statement today, saying Mike this is not a bake-off, get your man-pants on." Meanwhile, all the polls show that Castle would be a much stronger candidate in the general election. The Wall Street Journal editorial page called this election a "test of political pragmatism" and quoted William F. Buckley’s maxim that he always voted for the conservative who could win. We’ll see tomorrow if the Tea Party Express rides over the Reality Railroad.